‘Go Native’- The battle cry of concerned citizens trying to make a difference in this world of excesses and degrading natural resources, this is one place which is consciously resonating this thought on a war-footing and spreading the word. 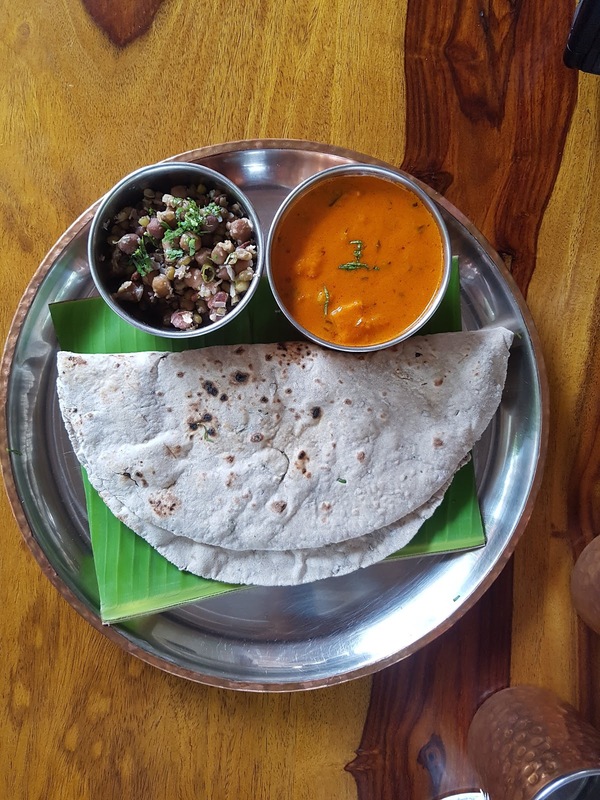 This all-vegetarian place, located in the calm locality of Jayanagar is an experience which humbles you with its simplicity and yet, you have an experience to talk about at the end of it all. We spend an eventful afternoon here sometime back, and while the food was definitely on point, I was hooked to the concept and its implementation here. This place is located in a green and serene neighborhood, with trees lining the pavements and makes you really think about the concrete jungle that we are in, in most other parts of Bangalore. Spread over 2 floors, this is a Bungalow that has been converted into a store and restaurant. There are several in-store brands to choose from, if you want to buy organic/homemade/natural items for your home. There are brands like Purple Turtles (Living/dining space), Teabox, Jus’ Amazing, Last Forest(one of my personal favs), Bandhej and many more. As you walk around the place, you realize that a lot of thought has gone into putting together the whole place. Airy, spacious, well-spread out and lovely wooden seating, while nights are pretty good here, a breezy evening can be well-spent here with some delectable snacks, masala chai and a nice book for company, as all you hear are the rustlings of the leaves on the nearby trees(and the occasional guffaws from people nearby, enjoying their food perhaps). 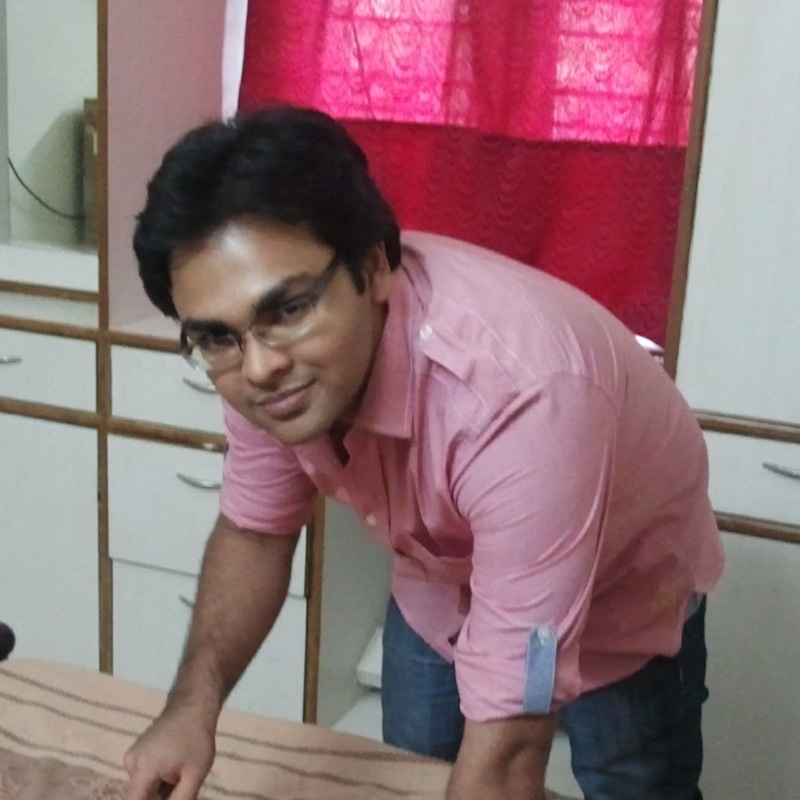 “Particular attention has been paid to the sourcing of the food, and we generally only have vegetables/fruits sourced from nearby farms within a period of 10-12 hours of being plucked from its source”, says Anvitha Prashanth proudly, the young entrepreneur, who started this place from scratch and now has a successful brand to show for her efforts. As we chat about the origins of this place, it is evident that she is really passionate about having a place which seeks to minimize its carbon footprint and yet churn out food that is really delicious. Khus Lemon Sherbet: The sweetness of khus,the sour lemons coming together to form the perfect summer drink, offset with mint leaves to give it additional freshness. Jackfruit and Coconut Milkshake: This was a lovely milkshake, and while it was heavier than it's sherbet counterpart, I would prefer to end my meal with a nice, fruity and sweet milkshake such as this. 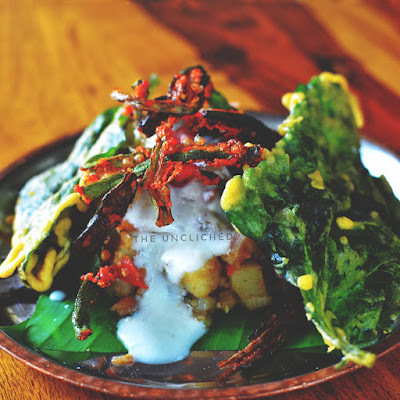 Aloo Patha Bhindi Chat: As a person who passionately hates okra/lady finger/bhindi, this was a dish I would not have tried, if it wasn’t for the insistence of my wife, who loves it. Surprise, surprise, this was a highly unusual yet yummy combination that I really liked. Crispy-fried bhindi and spinach leaves, on a bed of potato cubes and onion, topped with the holy trinity of Indian Chaat Accompaniments (mint chutney + tamarind chutney + sweet yogurt). A superb and yet, health dish to start off your meal. Baked Green Peas Ghughra: Ghughra is essentially a Gujarati dish, which is a crescent shaped pastry, which in this case is filled with a green-peas mixture, and baked to give a crispy outer-shell, and yet retain the goodness of the fresh green-peas and herbs mixture inside. I totally loved this preparation. Ragi Pizza: While this dish is definitely a crowd puller, it is really a reflection of how, farm-fresh and organic produce can result in a lovely (healthy, minus the lovely homemade cheese) dish, that ultimately results in an Indian adaptation of a dish we really love. 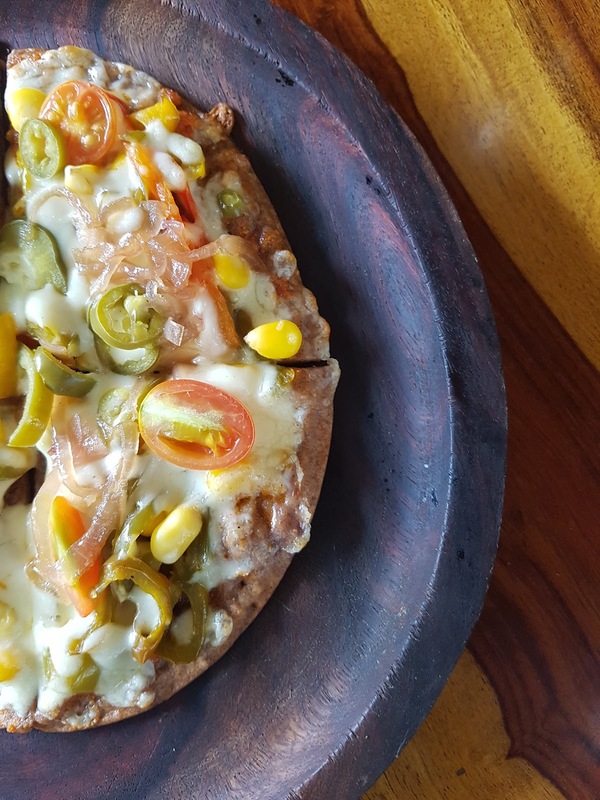 This pizza had a super-thin and yet crispy base made of Ragi flour and topped with a variety of toppings including organic cherry tomatoes and jalapenos on a bed of sun-dried tomato pesto sauce. Simply delicious. Masala Banana Flower Roti: For those looking for a more traditional lunch option, this is it. A couple of huge rotis, made with dried banana flower and banana flour, served with a tangy mutter paneer and a soothing sprouts kosambari, this simple, yet well-put together dish will please almost anyone. Malai Ghevar: An ultra-porous honey-combed sweet cake, made by repeatedly pouring chilled batter over hot oil, this is a popular North Indian dessert, and I was pleasantly surprised to see it on the menu here. 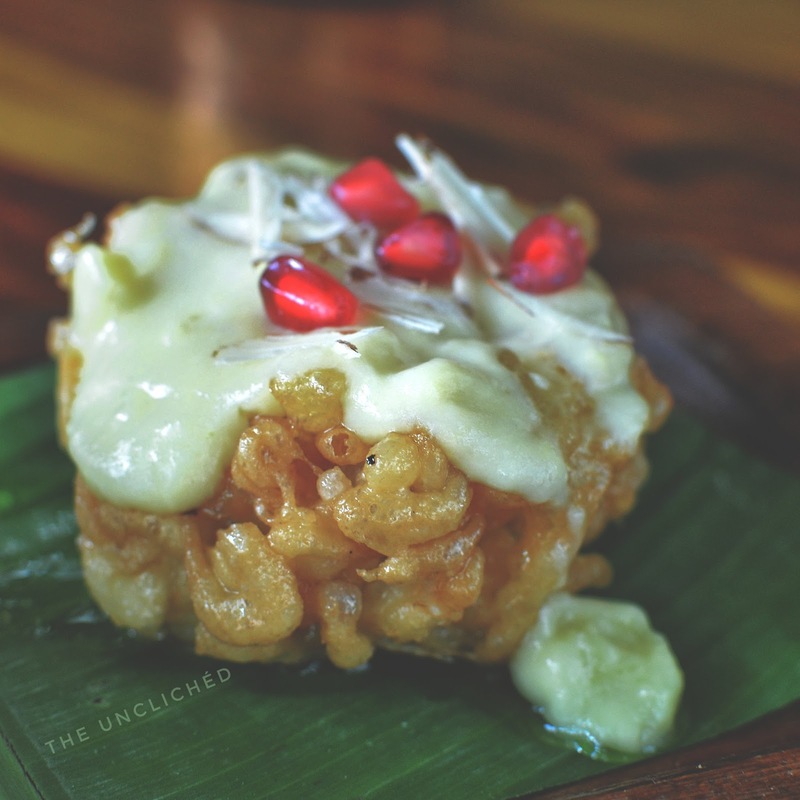 Go-Native’s version was a delicious mini-version of the original, topped with malai, aromatic ghee and pomegranate kernels to make a dessert that was super-delicious.